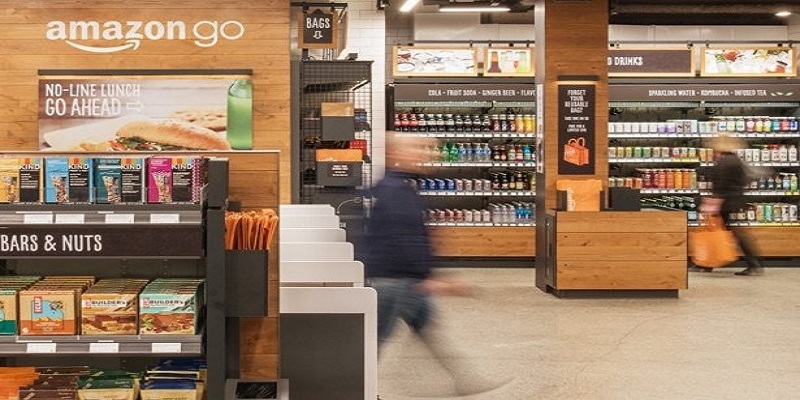 Updated to define how exactly Amazon go uses ai technology and not really software or programming as some people thought during the testing of the Amazon go concept. It’s a, no attendant glossary shop! Amazon Go uses ai, and it comes in at the time when artificial technology seems to make almost anything possible. And by the look of things, this no-checkout convenience store might boost amazon’s earning to newer levels. CNBC reported that by October 2017 the giant retailer enjoyed a revenue earning increase of $43.7 billion -compared to $42.14 billion the previous year. North American sales clocked to $25.4 billion while international sales were 13.7 billion. With the new Amazon Go, using ai technology, these numbers are expected to hike farther. Ever heard of automation? Now, this is the exact application of it. As in, Amazon Go ai use, is an automated grocery shop where you walk in, pick stuff and walk away -no cashier or representative to serve you. If you can recall sometimes back, around November or December to be precise, concerns about AI (artificial intelligence) taking away over 40% of human jobs took the better part of the internet news. Americans especially come out in social media and on national TVs to express their concerns but on the contrary, Germans and Chinese seemed okay with robots as an alternative workforce. With China even setting aside a budget of $2 billion to set up an AI pack. Well, let’s leave that for now, back to the No-Checkout Convenience Store, Amazon go use ai. How Exactly does Amazon Go, using AI works? Just like you are to visit any other physical shop or grocery store, you’ll also need to avail in person to make a purchase at the Amazon Go use ai outlet. Now, on arrival, you’ll need to launch the Go app, which will be availed on apps stores anytime after the launch, in a few hours. The app connects to your Amazon account and displays a 2D code which you’ll be scanning at the security gate. Basically, the code is meant to identify you (or if you like, you can also have someone else check in with your ID, a spouse, kid or friend) -which is your account, embedded on the app. Once you are in the grocery the AI algorithms starts to track everything you pick and keep. What you return to the counter won’t be charged to you. So for example, if you peak some veggies, apples and a few oranges and the price for the three amounts to $ 700. But you decide to return the oranges, with cost $200, the Amazon Go using ai is able to keep the track and summary. Which would be something like $700 – $200 = $500. The idea is, you’ll not be overcharged in any way. According to Kumar, amazon’s AI engineer, the technology behind Amazon Go uses ai and a combination of many techniques to ensure a smooth experience. Apart from the ID scanning at the entrance gate, they have employed the Facial-recognition technology, cameras and so on. Asked to go into details about the software used, Kumar seemed to avert questions pointing to that. He also said that while a shoplifter can walk away without paying, the Go shop still has to run as they look into combating such incidences in future. Reports have it clear that Amazon Go use ai app will be available for download anytime, after the launch of the shop. To get it, you’ll simply go to the iPhone Store and search “Amazon Go,” or on Google Store, if you are on an Android device. Ideally, you’ll not be able to access the store if you don’t have the app because it is by scanning the 2D code that the entrance gate lets people in. As at now, if you are around Seattle, you can have an AmazonFresh pickup and so on. Maybe, just maybe in the near future, the need for attendees on the shop will be inevitable. That is where the customer will want deliveries so we expect to hear something like Amazon Go use ai “home delivery employees.” If it comes to that, it’s obvious that 1000s of people will secure employment so there is really no need to be afraid of automation or the previously expected loss of over 40 percent of jobs to AI.